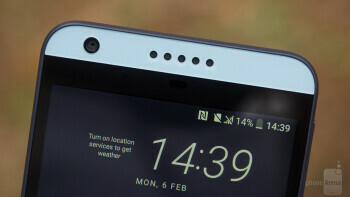 The Desire 650 exhibits a very HTC-compliant design, with five enormous front openings in the top and bottom bezel indicating there are BoomSound speakers there, and a huge camera lens circle on the back. It is made entirely of plastic, yet is not particularly light or compact for a 5-incher, on account of the sizable top and bottom bezels housing the BoomSound set. The soft-touch rear is grooved at the lower half for better traction and a more interesting look. Inserting a SIM card, or swapping your microSD when full are easy actions to do on the Desire 650, as there is simply a flap on the left covering both slots, and it is easy to pry open. We liked that the SIM card is hot swappable, so you don't need to switch off the _phone_ to change it (looking at you, Sony), and the Desire 650 automatically picks the carrier settings and sets the language according to the area. A 720 x 1280 pixels resolution screen is all you get with the Desire 650, which isn't surprising given the phone's price point, and at a 5” diagonal returns good enough pixel density for most tasks. The LCD display offers fairly credible color presentation that doesn't venture to the cold or warm side too much. It is rather dim for today's LCD standards, though, at barely 368 nits of peak brightness, and pretty reflective, so outdoor visibility under direct sunlight is a bit of a struggle. 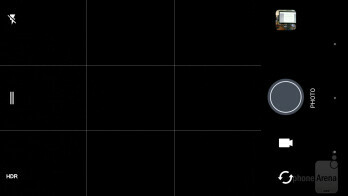 At 12 nits minimum brightness it is hardly comfortable to read on at night, too. The viewing angles also don't impress, as contrast and color shift significantly when the _phone_ gets tilted, and reflections abound. Inserting a SIM card, or swapping your microSD when full are easy actions to do on the Desire 650, as there is simply a flap on the left covering both slots, and it is easy to pry open. We liked that the SIM card is hot swappable, so you don't need to switch off the phone to change it (looking at you, Sony), and the Desire 650 automatically picks the carrier settings and sets the language according to the area. It is rather dim for today's LCD standards, though, at barely 368 nits of peak brightness, and pretty reflective, so outdoor visibility under direct sunlight is a bit of a struggle. At 12 nits minimum brightness it is hardly comfortable to read on at night, too. The viewing angles also don't impress, as contrast and color shift significantly when the phone gets tilted, and reflections abound. 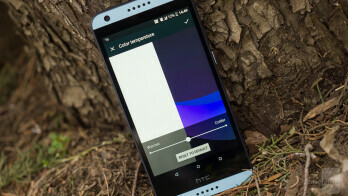 The HTC Sense interface on Desire 650 is very close to the stock Android 6.1 Marshmallow build underneath. 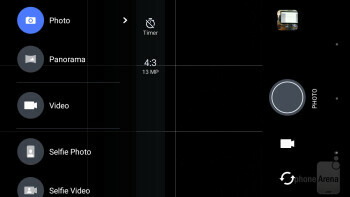 The notification shade is taken verbatim, for instance, but there are a few extras thrown in to differentiate like HTC's own theming engine and toolbox folder with things like a Boost+ “phone optimizer” app and a flashlight toggle. There is a 3-finger swipe gesture from the screen bottom that calls up the DLNA app for media output to a larger screen, too. Another one of these HTC interface add-ons is the BlinkFeed screen to the left, which serves as a news and social feeds aggregator you can tailor to your own desires. 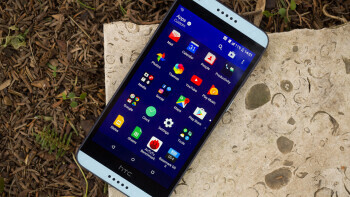 Other than those, HTC counts chiefly on Google's default apps for most everyday tasks. Running the Desire 650 show is a middling quad-core Snapdragon 400 chipset, clocked at 1.6 GHz, which is enough to push through the clean, simplified interface without much hiccups. With 2 GB of RAM provided, however, don't expect apps to open without loading waits, or your BlinkFeed to update as fast as you can scroll – it's a process. 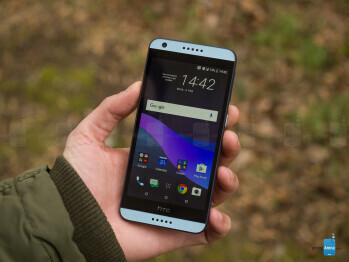 HTC provides the expected for the phone's price point 16 GB of internal storage, of which about 10 GB are user available from the get-go, so you might want to make use of the memory card slot on the left hand side. HTC has expropriated Android's stock Chrome browser for its Internet needs, which runs fine, with only a few scroll stutters here and there when several tabs are open. To get you on the Internet, the Desire 650 offers Wi-Fi/n, or 9 LTE bands, including US ones, with download speeds up to 150 Mbps, and uploads up to 50 Mbps. As for the rest of the radios, there is FM with adjacent app, Bluetooth 4.1 is onboard, as well as NFC, but only for the Desire models that will be sold in the EMEA regions. Wired connectivity is done via the good ol' microUSB cable. 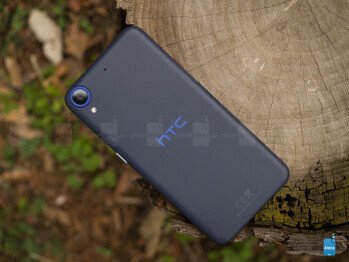 HTC placed a 13 MP main camera on the Desire 650, with basic f/2.2 aperture, and a 5 MP one at the front with HDR mode that is capable of 1080p video as well, and has a decent 77 degree frame range. 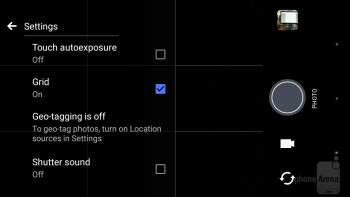 The camera app interface looks clean, but there are only two settings that are easily accessible – the LED flash and HDR on/off switches, everything else is tucked in a pull tab. The phone is no speed king while taking shots, especially in HDR mode, which takes 3-4 seconds to process and store a shot after pulling the trigger. 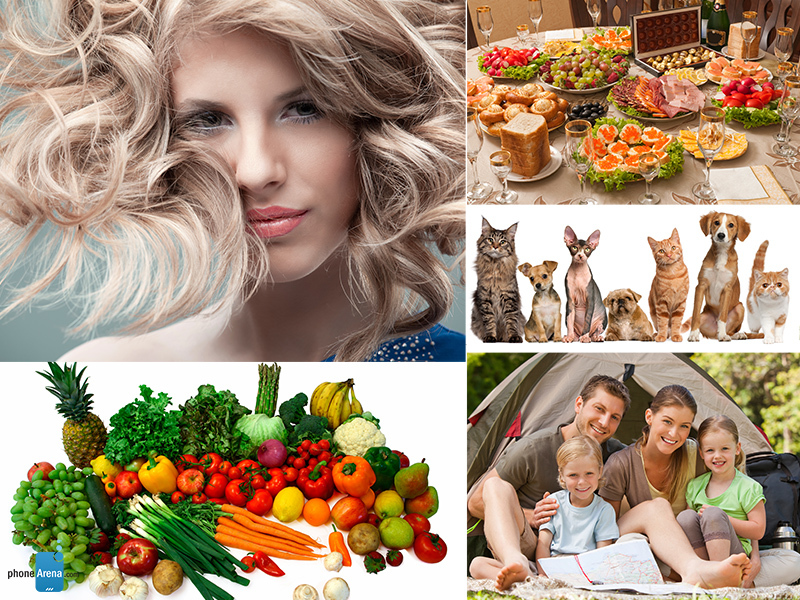 The non-HDR photos are of below average quality – they come way underexposed hence darker than the scene in front of the lens, with everything engulfed in shadows. Turning the HDR mode on does what it's supposed to do by taming bright highlights and exposing darker areas better, but it takes forever, and you have to hold the phone pretty steady in these few seconds an HDR shot goes to the gallery. Other than that, color presentation is good, returning true-to-life hues, but, again, only in HDR mode. 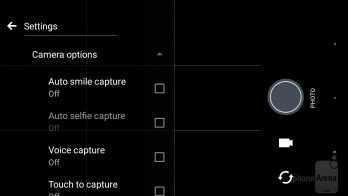 The selfie cam returns decent shots, which don't suffer from the underexposure mishaps of the main snapper. As can be easily expected with these camera specs, the phone struggles in low-light, returning some soft and noisy imagery, which get progressively worse as the amount of light dwindles. 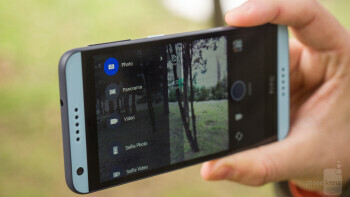 The handset is capable of 1080p video recorded with 30fps, which, however, is way underexposed and darker than it should be, and there is no HDR setting for that footage. Audio recording is in stereo, and the phone weeds out ambient noises well. HTC uses Google's stock Photos app as the gallery for showcasing pictures and videos, as well as Android's Play Music app for your tunes. We can't say that we are big fans of those, as they are pretty barebones, but they are well integrated with your Google account when it comes to backups, and you can always download better video or music players from the Play Store, if you wish. 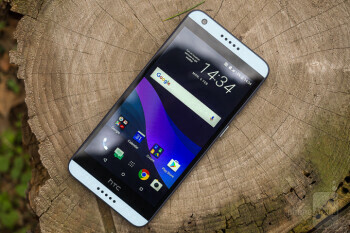 HTC prides itself in the audio prowess of its phones, even low-end affairs like the Desire 650, throwing around terms like “hi-res audio certified” and “BoomSound headset profile.” Well, both the headphone power output and the strength of the front speakers are nothing to write home about, but the sound is decent – it's a bit flat, but without noticeable distortions even at the highest volume end. The top BoomSound speaker serves as an earpiece, but, as we told you in the media section, its output is not very strong or full to begin with, so the words of the caller are ringing somewhat distant and hollow. The phone has two mics for noise-cancellation, but, again, while they weed out extra noises, the mics themselves aren't picking up the voice of our caller well, and the person sounded a bit lifeless and subdued. Given the 2200 mAh capacity, don't expect any wonders in the 650's battery endurance. HTC claims five and a half hours of Wi-Fi browsing and an hour more of HD video playback, and they are right on the money. We got 5 hours and 40 minutes of screen-on time during our in-house battery benchmark, so the Desire 650 will maybe get you through the day, but don't forget to charge for a night out. The Desire 650 looks like an attractive proposition in its sub-$200 category. It has a fairly stand-out design and some nice touches like stereo speakers and neat Android interface. It is plagued by a subpar camera performance and unimpressive battery life, though, as well as below average call quality. At the $170 price asked, one can expect much more only from the likes of Xiaomi or Oppo with no presence outside of China. Still, in this category the Galaxy A3 (2016) and Moto G4, for instance, go for a similar price and offer better cameras. Thus, what the Desire 650 has going for it is the appearance, so if you like that, and maybe really, really need stereo speakers, it will be a decent low-cost choice.